Lenovo has launched the K5 Note which will come in two variants and will be available from August 3 23:59. Processor: Lenovo K5 Note will come with a Mediatek Helio p10 chipset MT6755 which will be clocked at 1.8Ghz comparing with its earlier version K4 Note which had a Mediatek MT6753 clocked at 1.3Ghz. RAM: This phone will have two variants one with 3GB RAM and another with 4GB RAM. While K4 note came with only 3GB variant. Screen: K5 Note has a big 5.5” 1920x1080p screen with 1000:1 contrast ratio which is similar to that of its Chinese variant. Camera: Selfie Camera in the K5 Note is an 8MP sensor with 77-degree wide lens and the rear camera is a 13MP PDAF sensor. 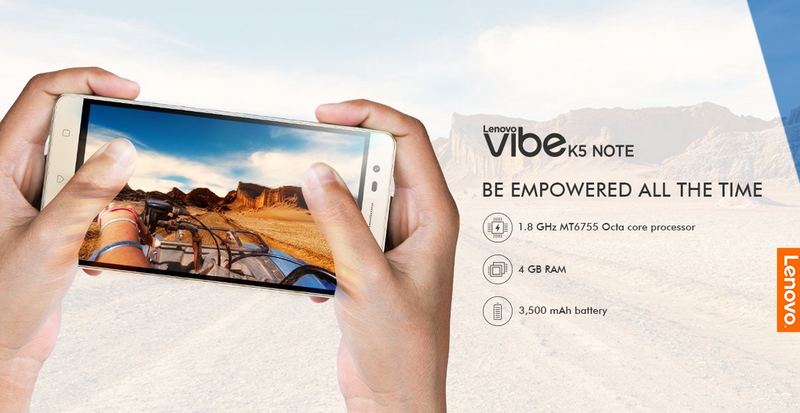 While in the K4 Note the rear camera was 13MP and the selfie camera was 5MP. Operating System: It will be running on Lenovo Pure UI based Android Marshmallow (6.0). This phone will come with a secure zone and SmartScene feature. Storage: K5 Note will have an internal storage of 32GB which can be expanded to 160GB with the help of a microSD card. Build: Phone has a metal body with a fingerprint sensor on the back and will come in three colors Champagne Gold, Graphite Grey, Platinum White. Pricing: Lenovo has priced both phones very aggressively the 3GB RAM variant is priced at Rs 11,999 and 4GB RAM variant at Rs 13,499. Other phones in this price range are Redmi Note 3, Meizu M3 Note, Moto G4 Plus and LeEco Le2, K5 Note has to compete with these phone which are already in the market and specifically to Redmi 3 and Moto G4 Plus which seems similar in terms specs on the paper. Gaming Bundle at Rs. 1999: Same as above this offer will also valid for the first day of sale and will contain Amkette Gamepad 2 and a ANTVR headset. There will be an exchange offer for the old Lenovo phones in which user will get a bumped up price for their old Lenovo phones.